Product prices and availability are accurate as of 2019-04-22 22:11:39 UTC and are subject to change. Any price and availability information displayed on http://www.amazon.com/ at the time of purchase will apply to the purchase of this product. Sperss is a term affectionately used to denote nostalgia for precious things lost with time - a homage to the origins of the winery and the generations who built it. 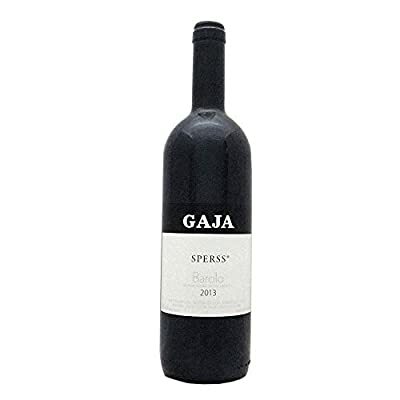 In 1988, nearly three decades after the fateful decision was made to stop acquiring fruit from the other growers and bottle only estate-grown grapes, the GAJA winery purchased a 30-acre farm in Serralunga d'Alba and rechristened it Sperss. 2013 - 96 points Wine Enthusiast, Cellar Selection The 2013 vintage is a historic vintage for the GAJA Winery. For the first time since 1996, the single-vineyard wines are 100% Nebbiolo. Fermentation with the skins in stainless steel tanks for three weeks, aged 12 months in barriques followed by 12 months in large oak casks. Fresh notes of dark berry fruit (mulberry and blueberry) and spiciness with aromas of liquorice, nutmeg, leather and candied orange peel. This wine shows mouth-filling fruit concentration well balanced by powerful, compact and sweet tannins.